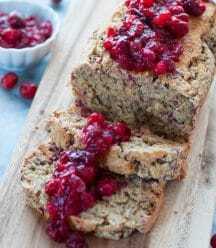 Vegan Cranberry Orange Quick Bread! It’s easy to make and even easier to eat! 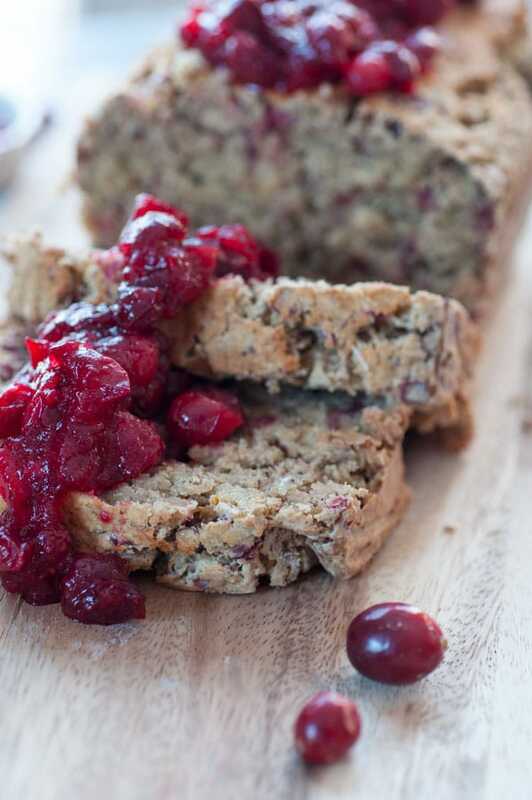 Our quick bread with fresh chopped cranberries and orange is a one bowl wonder. It’s so easy to make, and you’re going to love it, because there’s so much to love. It’s oil and butter free. Most quick bread recipes have one or both of those ingredients and ours doesn’t. We use one ripe banana to replace the oil. Did you know that you can use a banana or apple sauce as an oil replacer? You can, and it works. It’s refined sugar-free. We used pure maple syrup to sweeten this pretty loaf. It’s gluten-free. 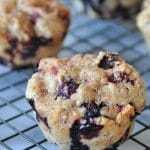 We used oat flour, all purpose gluten-free flour, and whole rolled oats in place of white or whole wheat flour. It’s made with whole plant based food. Whole oats, fresh cranberries, orange zest and juice from a real orange, and spices is all you’ll find in our cranberry quick bread, and it’s delicious. The texture is exactly what you’d expect to find in a breakfast bread. It’s firm and has the perfect crumb. It’s not dry, it’s not wet, it’s just right. It’s SO GOOD! How could it not be? 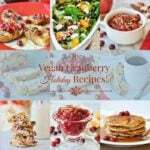 It has the tanginess and pop of cranberries, the sweetness of fresh orange juice, the slightly bitter zing of orange zest, warm and savory ginger and cinnamon, and that cranberry sauce topping is to die for. You could skip the sauce, but don’t. It’s super easy to make and it’s the crowning jewel of the bread. Make it in five minutes while the bread is baking and then let it cool and thicken. 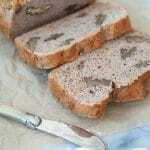 Spoon it over the entire loaf, or put it in a bowl and spoon it over individual slices. It takes the bread to another level. First – Mix all of the dry ingredients together in a large mixing bowl. Second – Add the wet ingredients and stir until completely combined. Third – Fold in the cranberries. Fourth – Bake the cranberry orange quick bread for an hour, or until a wooden toothpick comes out clean when inserted in the center of the bread. 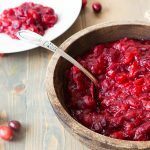 Fifth – While the bread is baking, make the cranberry sauce. 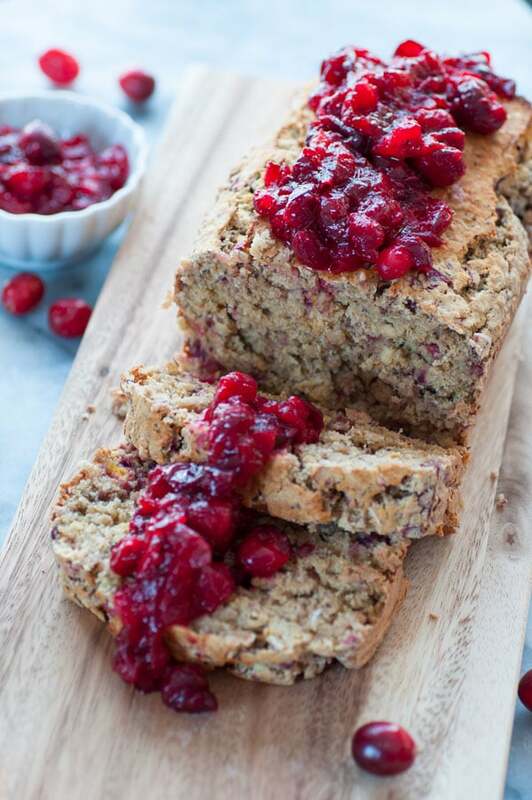 Five easy steps, that’s all it takes to make this healthy cranberry quick bread. 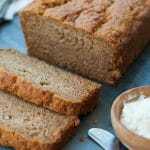 This is the kind of quick bread recipe that you can feel good about eating. It’s basically a bowl of oatmeal with fruit in bread form. Make it and let us know what you think, and take a picture and tag us on Instagram. We love seeing your beautiful creations. 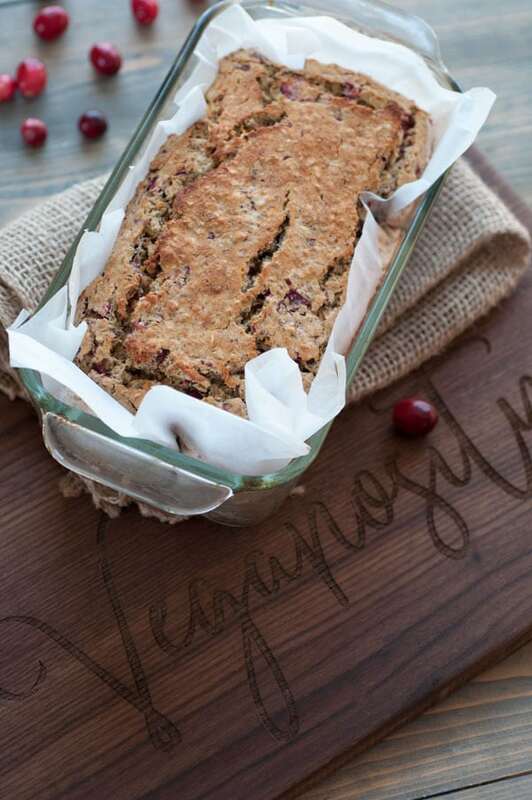 A quick and easy cranberry orange bread that's oil-free, refined sugar-free, gluten-free, and delicious! Preheat oven to 350°F (176°C) and grease or line a 8-inch (20 cm) bread pan with parchment paper. In a large mixing bowl, whisk the flours, oats, baking powder, baking soda, cinnamon, ginger, and salt until combined. Add the orange juice, maple syrup, vanilla, banana, flax egg, and milk and stir until well combined. Fold in the cranberries to combine and pour into the bread pan and press the batter until it’s evenly distributed into the pan. Bake for 1 hour, or until golden brown and slightly cracked on top and a wooden toothpick comes out clean when inserted into the center of the loaf. Let cool for fifteen minutes and then remove from the pan and let cool on a wire rack. In a small sauce pan on medium heat, bring the cranberries, orange juice, and spices to a boil. Reduce the heat to low and simmer until the cranberries have popped and the mixture thickens. Remove from the heat and let cool It will thicken even more as it cools. Spread over the entire loaf or individual pieces. Refrigerate for up to 5 days or freeze. 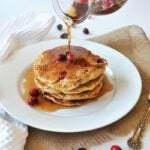 Yum, this looks wonderful and the flavors are perfect to brighten up gray winter days. Thanks!